"I would be glad to keep you informed about the latest developments in NetApp (partner) training and certification." Are you planning on achieving one or more NetApp certifications? Contact Fast Lane to find out more. We are happy to give you options and guidance, and develop a flexible certification plan that addresses your specific training needs. In addition to the recommended instructor-led NetApp training – available with Fast Lane – some exams and certifications require knowledge discussed in web based training. Besides, hands-on experience with NetApp products and solutions is highly recommended. 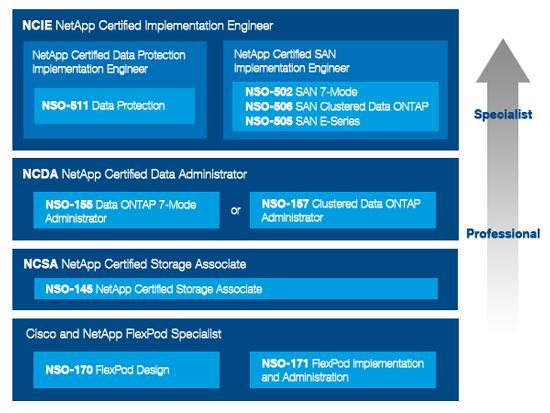 Further information on certification objectives and listed resources can be found on the NetApp website. Fast Lane offers NetApp Bootcamp training that provides practical, accelerated preparation for certification. Click here to take a look at the NetApp Bootcamp training Fast Lane offers. NetApp exams can be booked with testing provider Pearson VUE at the testing site of your choice. Visit www.pearsonvue.com or call on one of the phone numbers mentioned below to book or find out more. Pay your exam with a credit card or NetApp exam vouchers. Purchase your NetApp exam vouchers with Fast Lane.